Improving patient care safety and quality in Canada requires everyone’s involvement—patients and their families, healthcare providers, and leaders in healthcare organizations. The Canadian Patient Safety Institute launched a new initiative aimed at reducing the number of harmful, and sometimes deadly, mistakes that occur in Canadian healthcare facilities each year. SHIFT to Safety is a source for patient safety information in Canada for members of the public, healthcare providers and healthcare leaders. Our tools and resources empower everyone to understand how to make safety a priority while navigating the healthcare system. SHIFT to Safety represents a new way of thinking about the current state of patient safety. SHIFT to Safety provides current resources, tools and research, and deploys system level improvement collaboratives that are designed to integrate the public, providers and leaders into patient safety and quality improvement efforts with the goal of all three working together as a team. The Canadian Patient Safety Institute unveiled the SHIFT to Safety platform in Ottawa on July 20, 2016, broadcasting the announcement live using the Facebook Live feature. The format reached 534 unique viewers. In collaboration with Dr. Jeremy Grimshaw of the Ottawa Centre for Implementation Research of the Ottawa Hospital Research Institute, SHIFT to Safety will promote the use of knowledge translation and behavioral approaches in patient safety initiatives. Some 40 knowledge translation and implementation science faculty members have been recruited from across Canada and internationally to assist in the development, creation and deployment of a multi-faceted pan-Canadian program. SHIFT to Safety partnered with the Healthcare Insurance Reciprocal of Canada (HIROC) to recognize the signs of a deteriorating patient condition. Failure to appreciate patient status changes or deterioration is HIROC’s top medical legal risk across the Canadian healthcare system. The Canadian Patient Safety Institute, Patients for Patient Safety Canada and HIROC are working in partnership to create awareness and to provide evidence-informed tools and resources to the public, providers and leaders to help better manage the recognition of clinical deterioration in the adult and pediatric acute care practice settings. A suite of resources, curated from white and grey literature reviews and field consultation, is now available at www.shifttosafety.com. 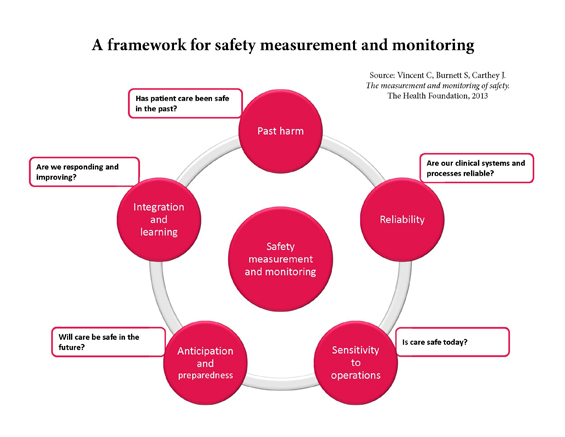 The Measuring and Monitoring of Safety Framework, created by Professor Charles Vincent (University of Oxford) and colleagues, helps the way we think about safety. It consists of five dimensions that healthcare regions, organizations, units, or individuals can apply to understand the safety of their services. This new approach provides a complete view of contributing factors and moves thinking from the absence of harm to the presence of safety. It can be applied from "ward to board" to provide a rounded and accurate real-time view of the safety of care delivery. The concept answers five key questions on how to think about safety: Has patient care been safe in the past? Are our clinical systems reliable? Is care safe today? Will care be safe in the future? And, are we responding and improving? The Canadian Patient Safety Institute hosted two webinars on the Vincent Framework: The Introduction of the Measuring and Monitoring of Safety (Vincent) Framework to Canada webinar was held on January 30, 2017, with 204 attendees; and Implementing the Vincent Framework at the Frontline webinar, held on February 23, 2017, with 208 attendees. The Canadian Patient Safety Institute has commissioned Dr. G. Ross Baker and his team at the Institute of Health Policy, Management and Evaluation to evaluate the implementation of the Vincent Framework to the Canadian healthcare context. This work will be undertaken in 2017-18. Dr. Baker and his colleagues are assembling a seven-team demonstration project to evaluate how the framework is being implemented, and its impact in measuring and monitoring safety. The research project is supported by the Canadian Patient Safety Institute, British Columbia Patient Safety and Quality Council and the Canadian Institute for Health Information. TeamSTEPPS®, the acronym for Team Strategies and Tools to Enhance Performance and Patient Safety, is an evidence-based teamwork system that includes a comprehensive set of ready-to-use materials and a training curriculum to integrate teamwork principles into a variety of settings. Working toward a fall 2017 launch, the Canadian Patient Safety Institute has been working with Canadian and international partners to cultivate the growing network of TeamSTEPPS early adopters, preparing resources, and identifying opportunities to learn from successes and develop capacity across the country in support of better teamwork and communication for patient safety. Enhanced Recovery after Surgery (ERAS) is a program highlighting surgical best practices that consists of a number of evidence-based principles to support better outcomes for surgical patients, including: an improved patient experience, reduced length of stay, decreased complication rates, and fewer hospital readmissions after surgery. As part of the Canadian Patient Safety Institute’s Integrated Patient Safety Action Plan for Surgical Care Safety, work on the ERAS project began in January 2017 with the support of 25 partners representing a number of key stakeholder groups committed to working together to help spread these best practices in surgical care. A project charter has been developed to guide the work and a governance structure is now in place, led by Enhanced Recovery Canada. The Atlantic Health Quality Patient Safety Collaborative was established in 2010 by the Atlantic Deputy Ministers of Health to aid in facilitation, capacity and relationship-building, and knowledge exchange to advance quality improvement and patient safety in Atlantic Canada. Key activities during the fiscal year include an Incident Management Training program, delivered to 40 participants in October 2016; co-partnering with the Canadian Patient Safety Institute on the development of the Canadian Guide for Engaging Patients in Patient Safety; and planning for a two-day learning exchange, to be held in Prince Edward Island in May, 2017. The Canadian Patient Safety Institute works with key partners in Ontario, supporting and participating in numerous local and provincial patient safety improvement efforts, knowledge transfer events and conferences. Last year, the Canadian Patient Safety Institute staff provided keynote presentations at the Joint Centres for Transformative Healthcare Innovation’s InnovationEX exhibition and exchange, and several Ontario Hospital Association conferences and webinars. The Canadian Patient Safety Institute also participated in the Patient Safety Incident Learning System Working Group (led by Health Quality Ontario [HQO] for the Ministry of Health and Long Term Care); continues to contribute expertise and technical advice to the Ontario Patient Safety Learning System Pilot Project; worked with the HQO’s Quality Improvement Community Advisory Group to help guide and launch Quorum, a new online community dedicated to improving the quality of healthcare across Ontario; and is a member of the HQO Patient Engagement Resource Development Advisory Group. The Canadian Patient Safety Institute provides national leadership, coordination and support to regional health authorities and quality councils in British Columbia, Alberta, Saskatchewan and Manitoba through groups such as the Western Quality and Patient Safety Representatives and the Western Healthcare CEO Forum. These groups identify quality and patient safety priorities with an aim to learn from each other and build collaborative opportunities for their provincial initiatives and programs. The Canadian Patient Safety Institute participated in multiple forums, conferences, learning events and judging panels, and regularly liaises with these groups to learn about local innovative approaches, and to provide information on national and global trends, challenges and priorities in patient safety improvement.